The Khadamat IT Services Department is operational with qualified staff, maintaining and supporting the company IT Systems and the building structured cabling throughout the facilities in the new campus. 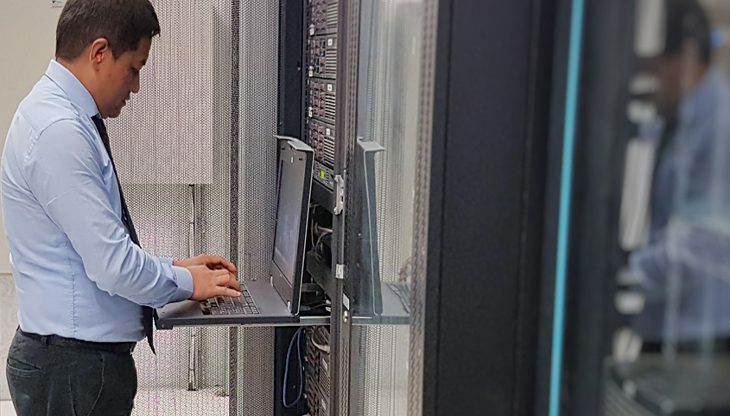 The delivery of IT services is provided from the Khadamat Data Centre which hosts a variety of technical services with Enterprise Infrastructure, Applications, Telecommunication and a number of head-end equipment’s for the Engineering Services Network (ESN). IT based applications to facilitate 24/7 Service Desk, Facilities Management, Timetabling & Room Reservations, Financial and Supply Chain are in place to support the services provided. The IT infrastructure ensures that these systems are stable and available to appropriate users all the time, especially during the core operating hours. The priority and focus of the IT Department is to provide seamless support to various departments in their provision of services to the customer and to efficiently maintain the corporate IT environment. UAEU’s IT Help Desk (DoIT) manages all network drives and may be contacted for assistance. For more information you may contact the Khadamat Service Desk at 03-7138000 or servicedesk@khadamat.ae. UAEU’s IT Help Desk (DoIT) manages all network connections and may be contacted for assistance. For more information you may contact the Khadamat Service Desk at 03-7138000 or servicedesk@khadamat.ae. Please contact the University’ s IT Help Desk (DoIT) for assistance. For more information you may contact the Khadamat Service Desk at 03-7138000 or servicedesk@khadamat.ae.